Based on what happened today, the only one that isn’t a disaster for the Trump administration right now is #4. The house is on fire, Trump is running around with a box of matches, and the GOP demands to know who called the fire department. * White House Press Secretary Spicer was in full damage control mode today. * There was also this from Spicer today – which seems right out of a definition for “newspeak” in Orwell’s 1984. Now some of [Gorsuch’s] former students have raised concerns about Gorsuch’s views on discrimination against female workers. Jennifer Sisk, who graduated from the University of Colorado Law School last year, says that during a Legal Ethics and Professionalism class last spring, Gorsuch told his students that companies should ask women about their pregnancy plans during job interviews, and claimed that many women plan to manipulate their employers by taking maternity leave, then quitting to stay home with their children. I’m not a lawyer. But even I know that it’s illegal to ask women about their “pregnancy plans” during a job interview. * Finally, here’s some news from Pew Research about generational party affiliation. 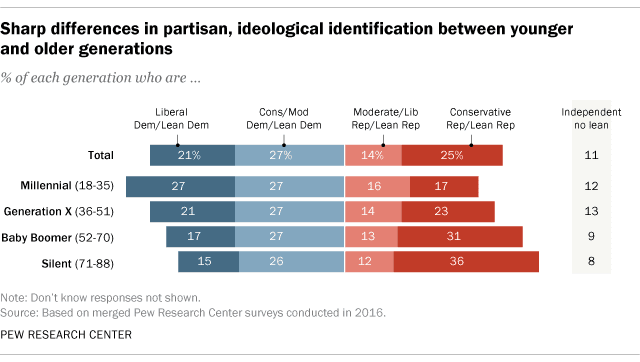 In case you are tempted to be dismissive and suggest that people get more conservative as they get older, Pew debunked that myth a while ago.